Amrun Village, 40km south of Weipa on the Cape York Peninsula, Far North Queensland. Ausco Modular is a market leader in building transportable infrastructure for the mining industry. With more than 50 years’ of experience in the modular building industry, we take pride in continuously pushing the boundaries to offer the best possible product. 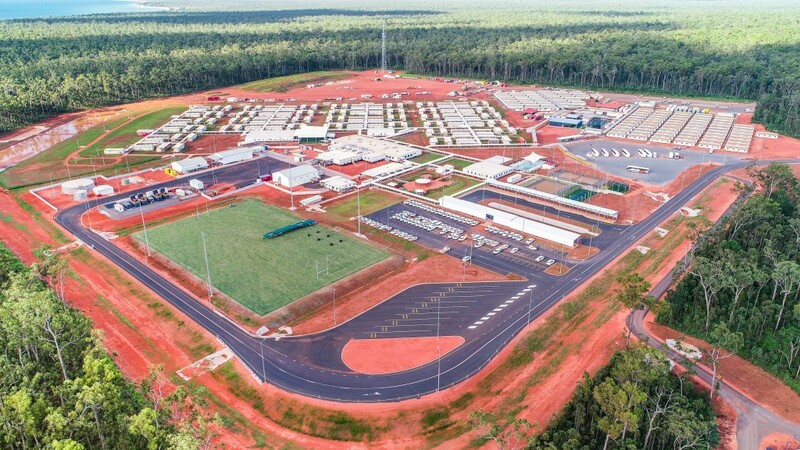 Our range of transportable mining facilities is innovative in design, extending from mobile or fly-camp solutions to full and permanent mining camps. Our portable, prefabricated buildings allow significant flexibility, thanks to their modular design. We know every project has a different requirement, so contact us on 13 62 11 to discuss how we can manage yours. Our mobile camps are designed to accommodate 30-300 people quickly and are manufactured to endure frequent, rugged relocations and fluctuating head counts. We deliver flexibility, comfort, rapid mobilisation and operational cost efficiencies across the full lifecycle of transitory type projects. Our ‘plug-and-play’ model allows you to simply arrive and occupy; then move the camp when required, fully ready for occupation at the new location. No destination is too far off the map for us. With our expertise and knowledge in the mining and energy sector, we understand that the biggest projects can sometimes be the most remote. That’s why our solutions are designed to be available in the most remote locations. Alongside our flexible range of high-quality accommodation, we can design you a fully functioning camp with everything that your workforce will need. You can choose to have a permanent or temporary village, and either way you decide you will know you’re getting a solution that will withstand even the harshest climates. With our camps we handle all the transport and installation, so you’re left using our camps to attract the best staff. With facilities like a gym, offices, catering and water facilities, potential staff won’t have to think twice about living in the camp. Ausco Modular provides a range of other options for regional and remote workforce accommodation to suit a variety of needs – like our managed camp solutions, Stayover by Ausco. Stayover by Ausco is a managed accommodation solution that gives you a fully-functioning resort-style camp in exchange for a simple nightly charge. With 24/7 reservations and state-of-the-art dining, this solution is perfect for many mining projects. The flexibility of Stayover by Ausco is unrivalled – you can choose to use one room or 200. It’s up to you. Amrun Village, 40 kilometres south of Weipa on the Cape York Peninsula in Far North Queensland. Plug and play mobile camps are ready to mobilise to any location in Australia, including Western Australia, Queensland, South Australia, the Northern Territory and New South Wales. When you need to keep projects moving to the next location, our team will be there to move the camp, ready again for occupying where and when you need it. 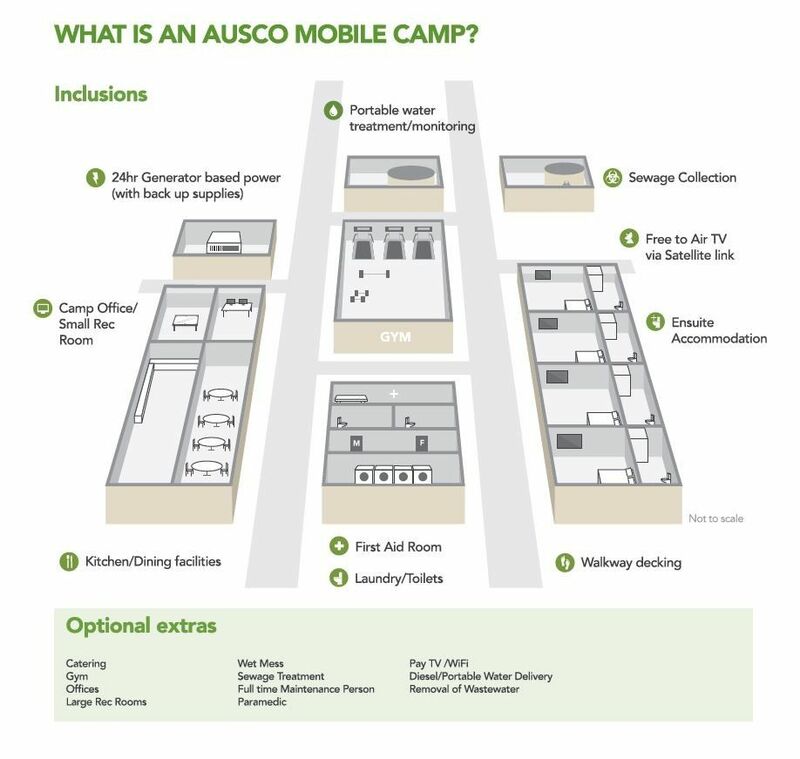 It’s easy to change your camp hire with Ausco Mobile. From a three month hire to 18 months - or anything in between - Ausco Mobile works with you to optimise your solution to suit your project timeframes. Similarly, with capacity to house up to and over 500 individuals at any one time, we can accommodate fluctuating workforce requirements quickly and with ease.